We are working to incorporate all your feedback continuously, adding new features, fixing bugs and improving the overall usability and performance. Please keep sending all that useful feedback! Today, we are pleased to announce a new version of Gitpod. To allow you using Gitpod as much as you want, during the beta you can now add extra Gitpod Hours whenever you run low on them! Most projects need special tools, which can be provided by naming a custom Docker image in your .gitpod file. Starting today, you can point to a Dockerfile that sits next to the .gitpod file. Gitpod will take care of building and caching it for you. 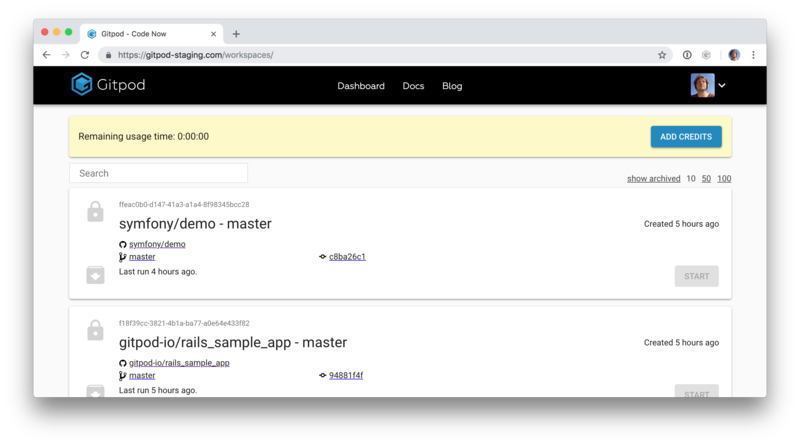 Instead of managing your own docker builds and versions, simply put the Dockerfile into the repository and you will always have a working setup for the branch at hand. Please read Gero’s post explaining this feature in more detail. We will add more features to the CLI. If you have ideas or demands please file tickets over here. 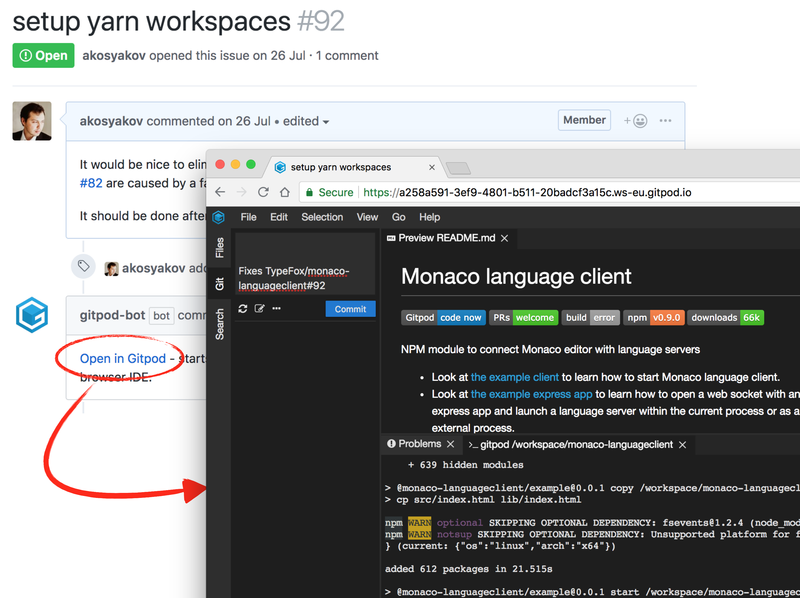 The Gitpod Bot for Github can automatically add Gitpod-links to issues and pull-requests. For instance, if you want to improve onboarding for new contributors you should configure the bot so it adds links to goodfirstissue or **help_wanted **tagged issues. We will shortly write a post dedicated to streamlining the contributor’s experience. Preferences and user preferences now allow for customizing your experience individually or per workspace. 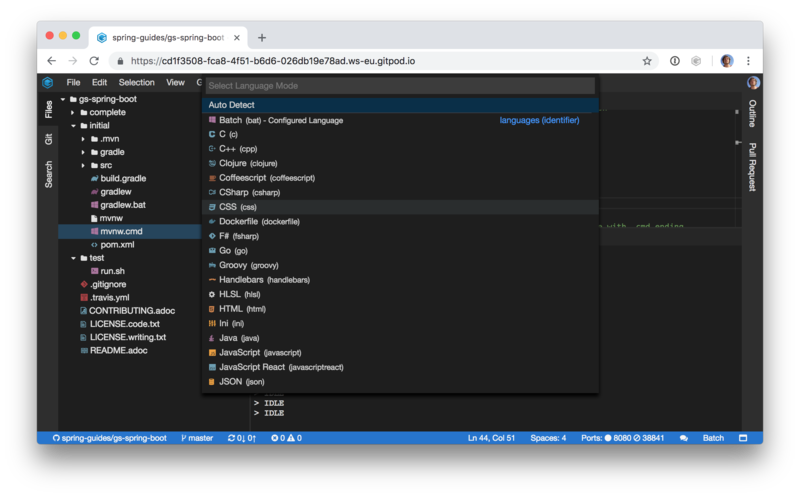 The workspace preferences are stored in the git repository, while the user preferences are stored in your account and will be used across all your workspaces. Sometimes you want to manually change syntax coloring because e.g. no file extension is present. Clicking on the language name in the status bar now allows to quick pick what language to use for an opened editor. In case you want to work a bit longer on a workspace you can now change its description. Also the workspace id is shown in the dashboard so you can tell apart multiple workspaces for the same context. There are plenty of other improvements and fixes that didn’t make it to the list. For instance, Go-projects are now automatically set up correctly even without any configuration. Also there are plenty of enhancements that have been added to the TypeScript language server. 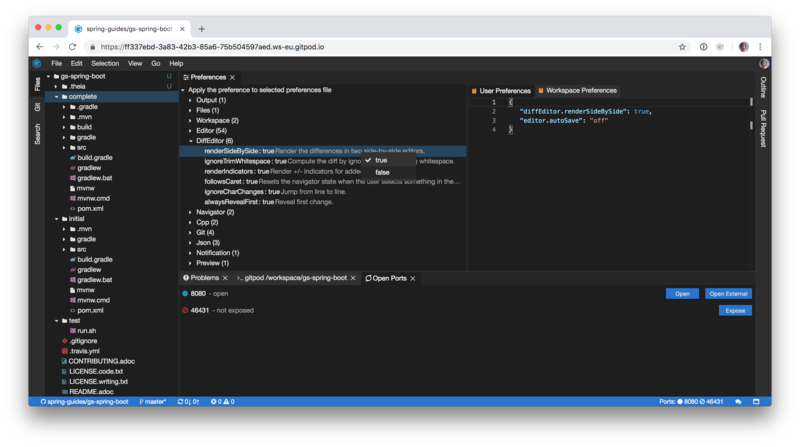 TSLint now works great and we laid out the foundation to add specific editing support for more frameworks and linters such as Vue.js, Angular and ESLint. In addition to the explicitly mentioned features you can find a full list of fixes and changes in the Theia repository. We are targeting a regular release cycle of one month with smaller continuous updates in-between. For the next release we will focus heavily on improving the startup time as well as the lagging dashboards in the US and the Asian region. Besides that we have some exciting new features up our sleeves as well.